Our fall Bahamas collecting expedition just wrapped up this week. One of the most challenging aspects of these expeditions is to get the fishes and invertebrates to Boston alive. After many hours of "packaging" them up, they were loaded into the cargo bay of a plane and flown north. A little over 3 hours after taking off from Miami, they touched down at Boston Logan airport. It was then our job to get them unloaded, unboxed, unbagged, and into their holding tanks with cleaner water as soon as possible. With over 300 animals coming to the Aquarium, and haste being a necessity, we formed a good-sized team of Aquarium staff, volunteers, interns and co-ops to perform this task. After a group briefing-slash-pizza party, it's off to the airport to go pick them up. Once back at the Aquarium loading dock, all 46 insulated shipping boxes were removed from the truck and taken to the identification table, where experts Barbara and Sarah, 2 of the 3 expedition leaders, ID'd the animals and passed them off to "runners" to take them to their appropriate gallery and tank. Because the water they live in during the flight deteriorates rapidly, tank water was slowly added to their bag while floating at the top to reduce the shock of the new fresher cleaner water. Once acclimated, they were released, counted, and marked on the tank glass to keep our census records accurate. Most survived the ordeal, and are currently going through quarantine before they make their way to one of our exhibits, including the G.O.T. Welcome to the New England Aquarium new residents! My day today started at 2:45 a.m. I have to admit that the first couple of minutes of getting up were challenging but the excitement kept my eyes open. By 4 a.m. the music was blaring and everyone was at their stations. The basic process of boxing up the fish goes as follows: We have four people to re-catch all of the fish out of their tanks bucket by bucket. Depending on the size of the fish those people then scream down to the two box people who prepare a box with a Styrofoam container and all right sized bags for the fish. The box and bags then head to the water pourer who allocates the perfect amount of water in each bag before the fish get placed in. When the box has all of its fish it is handed over to the bagging table where two people fill up the rest of the bag with pure oxygen and seal it with a special rubber band. Then the fish are identified and one person writes it all down, puts a number on the box, and brings it to the packers. These two people box up the Styrofoam containers and attach an appropriate label. Lastly, there is one person who records all of the boxed animals and sends an email letting the aquarists in Boston know what to expect. We worked for several hours, the sun came up, and then we worked several more hours. At around 9 AM we were loading all of the boxes from the boat onto our rented box truck. Sherrie, Pete and I drove all 46 boxes to an airline loading dock and lifted them one more time onto a shipping pallet. Happily, we waved goodbye to the fish and wished them luck on their 1:50 p.m. flight to Boston. The stress rolled off our shoulders as we drove back to the boat, laughing the whole way about all the funny experiences of the trip. Back at the boat we exchanged high fives, hand shakes and hugs with rest of the team. Now that the participants have left, the staff will spend the next couple of days breaking down the boat before returning home to Boston. But before all that comes a nice, long nap! One more thing I would like to say before falling asleep for an undetermined length of time. Even though I had a thorough explanation beforehand of what to expect on this trip I had no idea what an incredible experience this would be. I suppose it is hard not to have an amazing time when you are stuck on an 80-foot boat for 10 days with fifteen adventure-loving people who are all there to support the aquarium. We were all fortunate to experience the exhilaration of catching a fish knowing that thousands of people will be able look at with wonder. Beyond that we all renewed our love and appreciation for the three-dimensional world of marine science. If you are interested in future trips please contact Sherrie Floyd at sfloyd@neaq.org or Sarah Taylor at staylor@neaq.org. Great news! 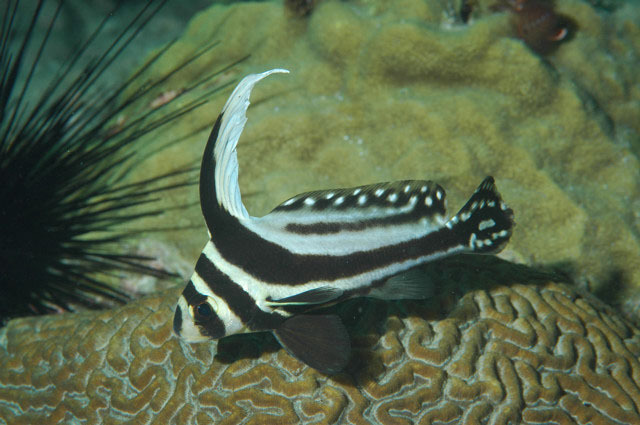 We finally got our trip fish: the spotted drum (Equetus punctatus). It was a two dive mission. On the first dive the whole group was involved in catching timid fish called copper sweepers but during that dive one of the participants noticed a spotted drum. At the time he had no nets so he took some pictures and noted the location. Slyly and perhaps wisely he kept this information secret. The only person he told was Captain Lou, who happens to be one of the best fish catchers. On the next dive it took all of three minutes for Lou to scoop the fish up and then the participant was awarded a shirt that featured our boat, the Coral Reef II. It is nearing the end of our trip and our dives are becoming more recreational as there are less fish to catch. We have a few relaxing dives left in the crystal clear 85 degree water. Then tonight we will step onto land for the first time in a week as we explore Alice Town in Bimini. As for fish collecting, Sherrie has informed us that we have almost all the fish on the list and in record time. Our fish wells are full of beautiful fishes and invertebrates that, after a little quarantine time, will be on display in our Giant Ocean Tank, Tropical Gallery, or Blue Hole Tank. To prepare them for their new home there is a lot of work to be done. By now the staff and the participants are all become one giant team that is excited to do what it takes. Stay tuned for the exhilarating madness of pack day and the fishes' first flight in an airplane. This morning we woke up and Captain John informed us that instead of diving we would be seining. This requires a lot of teamwork and skill and took about 20 minutes of debriefing before we launched the small boat and traveled to the beach. We had four people designated as net pullers (being of short stature I did not make the cut), then we had one snorkeler on the backside of the net to make sure it didn't get caught on rocks (me). The rest of the group lined up on either side and splashed the water like a two-year old throwing a temper tantrum in order to scare the fish into the middle. Expedition members use a seine net in May, 2008. Once the 100 foot net reached the beach the entire group grabbed the top and bottom of the net and held it like a hammock. Then we slowly rolled the end towards the middle to gather the fish in one spot. We gathered until we were all in one big group circle shouting out the names of all the diverse fish we saw. After all that work we were finally able to scoop them out into waiting buckets. The needlefish are a beautiful long iridescent fish that are the stars of the surface of the Giant Ocean Tank. In the ocean they calmly drift and blend in with the ripples of waves but when it is feeding time they can shoot towards prey with speed. Right now they are resting in one of our large holding tanks and snack daily on store-bought shrimp. If it weren't for the fact that our meal tonight is going to be grilled 10-oz. boneless New York sirloin strip steak with roasted onion-garlic-shallot mashed potatoes, broiled parmesan asparagus, and corn off the cob, I would be jealous of the needlefish! Well, I better be off, looks like it is dinner time! Going on this trip has so far been fun because of the numerous dives, delicious food, and enjoyable company. In addition to all of that I found out that there is quite a process that starts with a diver splashing into 85 degree Bahamian water and ends with someone being able to look through the glass of the Giant Ocean Tank (GOT) and observe a complex and beautiful ecosystem. I should first mention a couple of reasons why the New England Aquarium chooses to catch their exhibit fish with hand held nets. The first one is that this biannual trip provides an engaging and educational vacation for the participants. In fact, five out of the eight participants on this trip are repeat participants from previous trips! Secondly, when it comes to collecting fish, this method allows us to take just the right number of fish and species that we need without harm to any other fish or the environment. Catching by hand allows us to be very specific with what we want without taking any bycatch (Learn how the Aquarium is working to prevent bycatch in the fishing industry here). In addition, using nets gives the fish a fair fighting chance--in fact most of the time they win and the divers are left shouting unheard expletives into the open water. However, if we are fortunate enough and we catch a fish with our nets we are careful to bring the fish up. We do this by clipping our catch bag to a barrel underwater and slowly bring up the barrel (5 feet every 10 minutes). This allows their swim bladders to slowly adjust and reduces stress to the fish. Once they are at the surface everyone is involved in a mad dash to place the fish in a bucket, find out the species of fish, count them all and then place them in the correct tank (of which there are about 25). Then to take care of the fish the staff wake up, before the sun, and do a full system check. This involves observing the fish (right now there are about 200) for aggressive behavior, checking the amount of dissolved oxygen and the temperature of all of the tanks, and backwashing the system to help improve water flow. Most of the animals are fed chopped up shrimp or, if they are tiny animals, brine shrimp (otherwise known as sea monkeys). Thinking back on all of the responsibilities we have during the day to take care of these 200 fish it really makes me appreciate all the work our aquarists do back at the New England Aquarium - they have almost 30,000 animals of around 800 different species to look after! Well, it has been a full day I better get some rest so that I can do even more tomorrow. #10: Many People Ask - Are The Stingrays Dangerous? We're frequently asked about the stingrays in the Giant Ocean Tank. Aren't they dangerous? Aren't we afraid they are going to sting us? The answer is simply no. Stingrays are gentle creatures and aren't aggressive towards humans. Of course, they would defend themselves if they were threatened (as any other animal would) so we're sure to act appropriately when we're in the exhibit. We don't startle or scare the rays while we're diving. We also clip their spines so that we don't have to worry about getting accidentally injured. Earlier this week, we noticed that the spines had grown too long on both the male and female cownose rays. We called our Animal Health Department and scheduled a quick exam and spine clip. The fall 2008 collecting Expedition is underway! Educator and blog author Megan Moore (left) joins NEAQ staff, including Sherrie Floyd (far right) on the September 2008 Bahamas collecting expedition. Yesterday we made the 6-hour voyage down the river that runs though Miami and across 40 miles of ocean to the Bimini Islands. The trip was everything everyone was hoping it would be: calm. The Dramamine in our stomachs prepared us for swells and rolls but Captain John only reported waves ranging from 0-8 percent! In fact it was so calm that a pod of 6 dolphins decided to surf the waves off of our bow. An incredible sight. The rest of the afternoon was a whirlwind of excitement. Before we had even cleared customs people were pulling out tanks, checking gauges, inflating BC's and pulling up wetsuits. Our first dive was a quick get-your-feet-wet kind of a dive - no collection nets allowed. It was quite a tease to drop down 25 feet and look around at all the fish you were hoping to catch. After that first dive we were all so excited that by 5:30 p.m. we were giant-striding back in for a second dive before dinner. Every diver made sure they had two large plastic nets with mesh at the ends and a small Tupperware-like catch bag clipped to their diving vest. This time our nets carefully closed around several beautiful fish, including 3 four-eyed butterfly fish (pictured below). When catching butterfly fish we had to first check if they were paired up or swimming stag. Butterfly fish bond for life and we do not wish to cause them any stress by separating them from their partners. In fact, you can see several happy couples in the Giant Ocean Tank at the New England Aquarium. When collecting a pair of butterflies the trick is to catch one and then place it in your catch bag. Eventually the fishy partner will come around looking for his lost mate, see it in the bag, and stick around until we catch it. Then we re-unite the two (in the catch bag). The lucky couple will then stay together in their own private tank on the boat--almost like a honeymoon suite! Then it is the aquarium staff's responsibility to keep these fish well fed and swimming in clean water until we return to Miami. So besides the relaxing dives, beautiful sunsets and gourmet food I am also lucky to learn the skills necessary to help keep fish happy. More to come on that in my next blog. People often ask us how we get new animals into the Giant Ocean Tank (GOT). Depending on the animal(s) being acclimated, we use a variety of techniques including hidden cages, netted barrel corals, stretchers, pickle barrels, and floating pens. Yesterday we added 5 new fish to the Giant Ocean Tank. These redfin needlefish, Strongylura notata, were collected during our Spring Bahamas collecting trip. They arrived in Boston on May 13th, and after 4 1/2 months in quarantine and growing up behind the scenes, they were ready for their new home. The needlefish were transferred via bin and bag from their holding tank to their pen in the GOT. We built a special pen for their acclimation, which we floated at the top of the artificial reef. A pen is used for their acclimation, to increase their chances for surviving in their new environment. Without this protection, they could fall prey to some of the G.O.T. inhabitants.